A tropical disturbance will likely be classified well west of Mexico soon. Deep convection is increasing over the circuation. This feature is not a threat to Mexico. As of 8:00 am edt / 5:00 am pdt the disturbance was centered near 12.3° N / 121.5° or about 1050 miles southwest of Cabo San Lucas, Mexcio. Top sustained winds are estimated at 35 mph. It is moving west northwest at about 10-15 mph. Not much change from our previous update. Just a little more convection over the center. 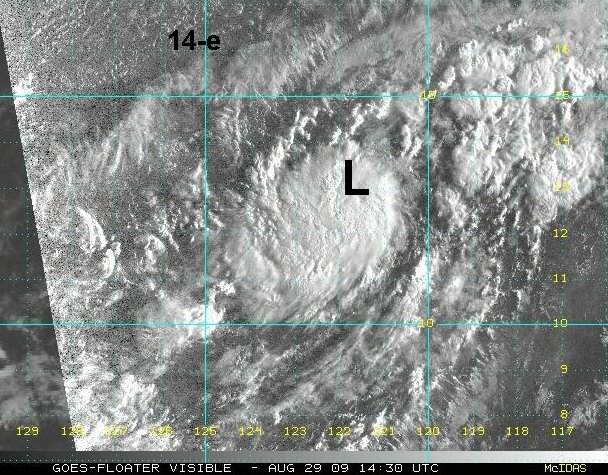 Enough of a change though for NHC to officially classify 14-e. It will likely be upgraded to tropical storm Kevin by this evening. Forecasts call for a general northwest motion which will limit intensification over cooler water. As of 11:00 am edt / 8:00 am pdt tropical depression 14-e was centered near 13.3° N / 121.5° or about 1010 miles southwest of Cabo San Lucas, Mexcio. Top sustained winds are estimated at 35 mph. It is moving northwest at about 9 mph. 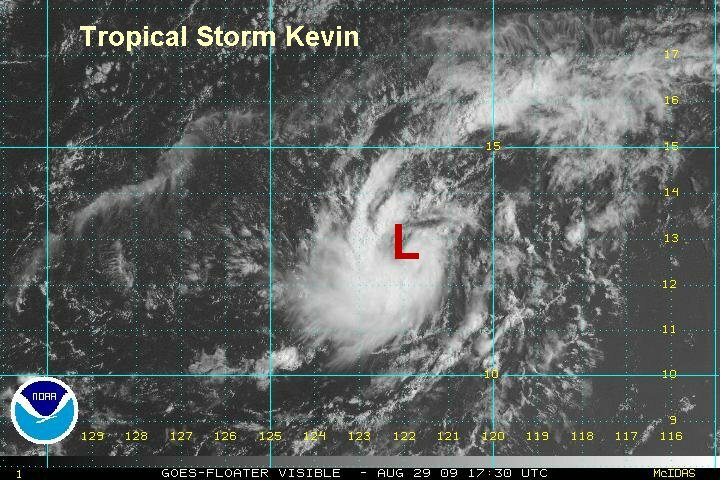 As expected Kevin was classified as a tropical storm on this last advisory. It appears it just barely qualifies. a nice low level circulation is noted, although convection is mostly south of the center. As of 5:00 pm edt / 2:00 pm pdt tropical storm kevin was centered near 12.8° N / 122.2° or about 1065 miles southwest of Cabo San Lucas, Mexcio. Top sustained winds are estimated at 40 mph (NHC estimates 40 mph). It is moving west northwest at about 5 mph. The convection with Kevin increased some overnight, nothing dramatic though. It is moving north toward cooler water and should start to weaken in the next 24 hours. Forecast models curve it more northeast in the next 1-2 days. As of 8:00 am edt / 5:00 am pdt tropical storm kevin was centered near 14.6° N / 122.2° or about 975 miles southwest of Cabo San Lucas, Mexcio. Top sustained winds are estimated at 45 mph (NHC estimates 50 mph). It is moving north at about 7 mph. 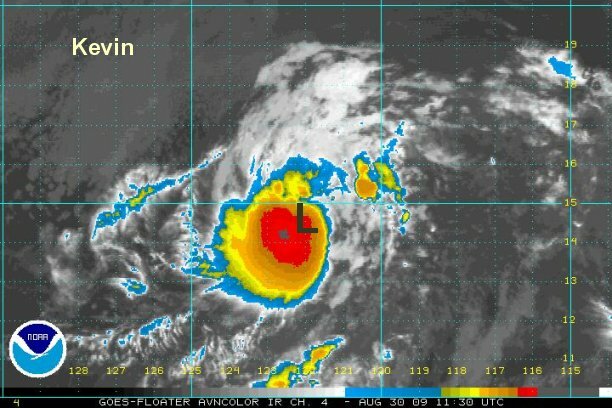 Kevin still is holding onto a little convection. It is still a minimal tropical storm at about 40 mph. 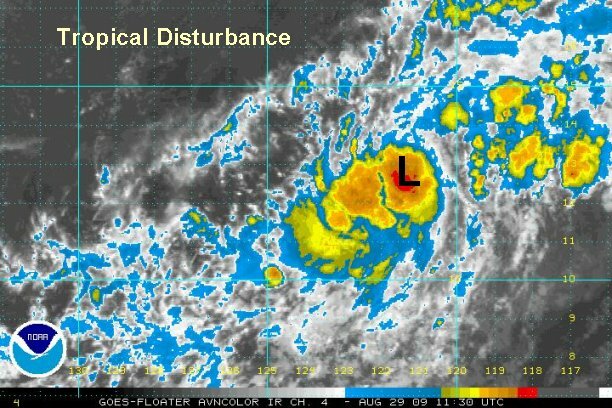 Kevin will be downgraded to tropical depression on the next advisory. It has been sheared badly and should not be classified as a storm any longer. This is our last update on Kevin.